Champion, champion sire Royal Quick Dash has died. Q-RACING JOURNAL—MAY 8, 2018—Champion Royal Quick Dash died May 7 in Brazil, reports owner Sandra Soto. The gray stallion was foaled in 1989, the product of American Quarter Horse Hall of Fame sire First Down Dash and the Beduino (TB) mare Harems Choice. He was bred by Vessels Stallion Farm LLC. He made his race debut, a winning one, in February 1991. He quickly qualified to the Sun Country Futurity (G1), in which he ran eighth, and then qualified to and ran fifth in the Kansas Futurity (G1). 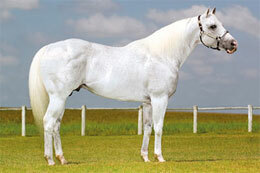 He would then win the All American Futurity (G1) with a driving performance, giving his sire the very first of a record six All American winners. That year he was honored as the champion 2-year-old colt. He would finish his racing career with seven wins, five seconds and two thirds in 18 career starts, and earnings of $1,046,980. As a successful sire, he has to date sired 1,483 registered foals that have earned more than $20.3 million. They are led by champion and All American Futurity winner AB What A Runner ($1,342,389), as well as Quick Moon Sign ($419,781), Sixes Royal ($384,977) and SF Royal Bank ($359,937).